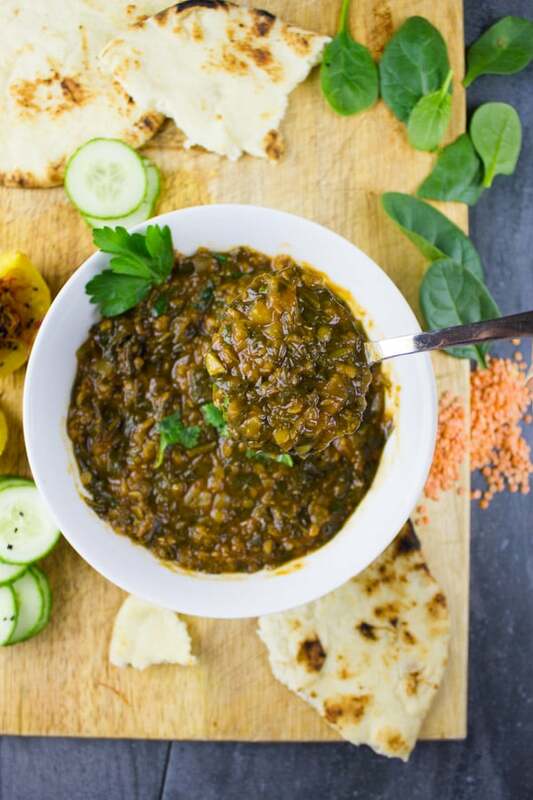 This North African lentil stew features a flavorful base of onions, garlic, tomatoes and herbs to which a generous amount of lentils and spinach are added and cooked through. An easy one-pot meal for cold days! You know how they say you can’t judge a book by its cover? Well, you can’t judge this One Pot Meal of Lentils and Spinach recipe by its looks. 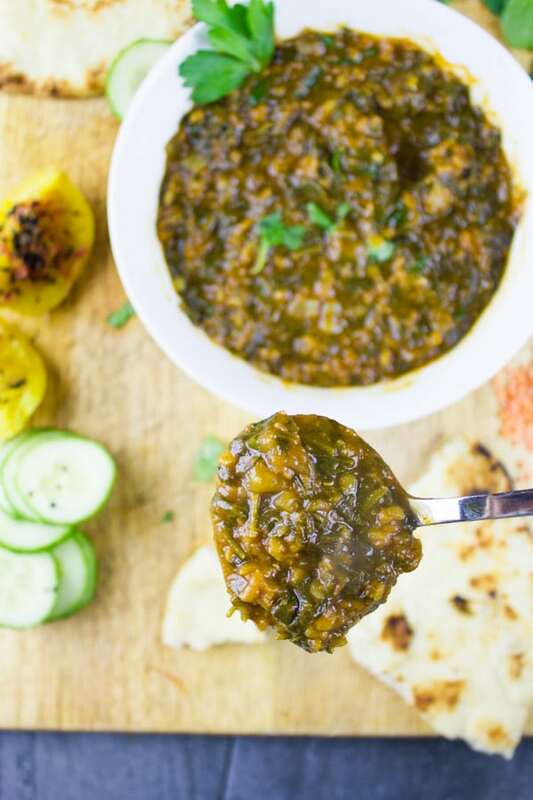 This North African lentil stew is absolutely delicious and heartwarming! This thick and savory spinach and lentil stew is as simple as can be. Very few ingredients, all in one pot for less than 30 minutes, and it keeps you full for a long time! So it’s a must try recipe specially if you’re looking for a vegetarian or vegan meal to sneak in to your busy week. I’m really excited about this North African-inspired lentil stew recipe. Like many other recipes on the blog—this one pot meal has a special place in my heart. You see my mom used to make it when I was a kid and I resented tasting it just by the look of it. Horrendous I know. 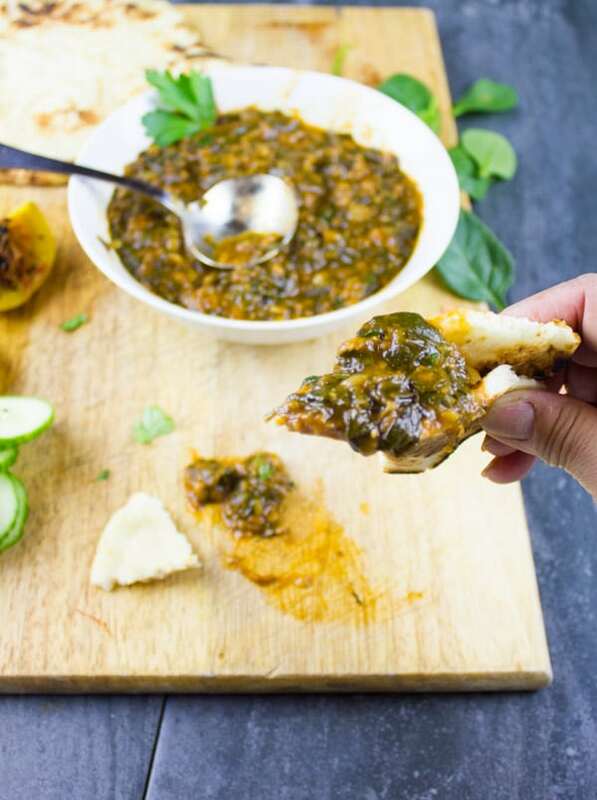 This recipe is actually a really old one, and it’s very popular in North Africa so I made it as is without changing or twisting a thing about it. It’s very unlike me, you know how I always love twisting recipes. But I thought this time, I’ll just watch my mom make it her way. The same way my grandma made it too. And I didn’t feel I needed to change a thing. 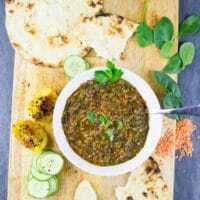 This lentil stew is perfect the way that it is— a flavorful base of onions, garlic, tomatoes and herbs to which a generous amount of lentils and spinach are added and cooked through. Since I’ve been lucky to have my mom stay with me the last couple of months, I’ve been asking her to make those meals I rarely make on my own. Don’t ask why, I just don’t know. Like those amazing Juicy Spicy Turkish Meatballs, why on earth didn’t I make them for so long! They’re another MUST try by the way if you’re looking to jazz up or swap your everyday meatballs. 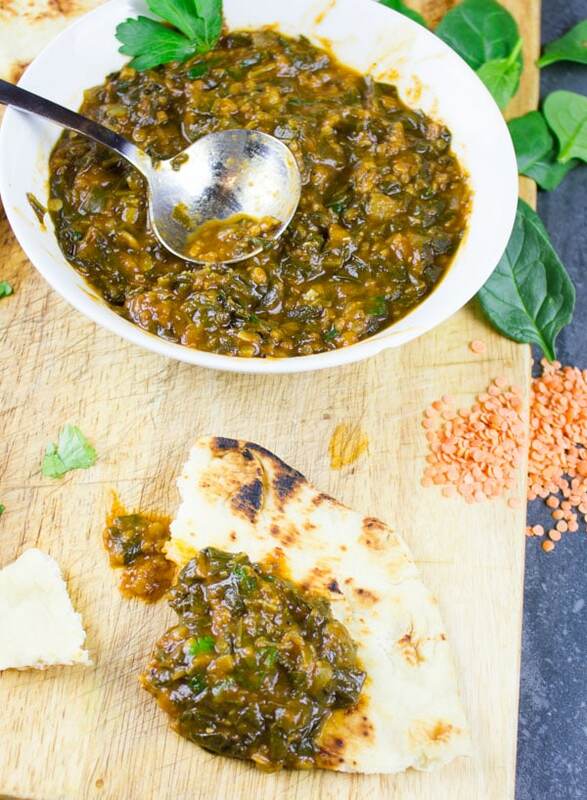 What to serve with North African One-Pot Spinach and Lentil Stew? 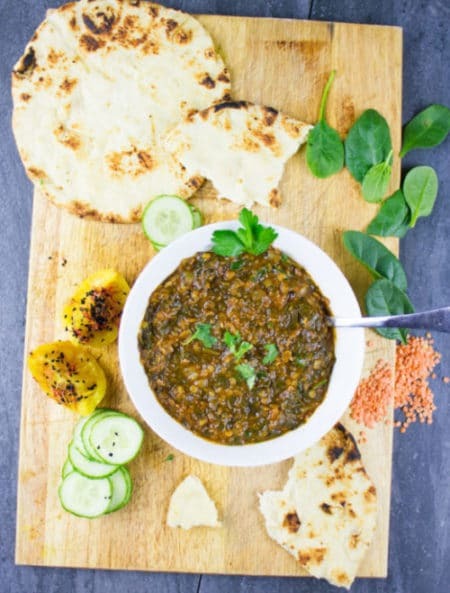 Classically this lentil stew with spinach is served with bread. I had some naan bread which I just warmed up a bit and it did the job! On the side, my lovely mom had made some of her famous pickled lemons—which I promise to have up on the blog too. The recipe is super easy and the lemons seriously addictive! I just love simple comforting one-pot meals like that—quick, delicious, nutritious and heart warming. You just can’t go wrong. I’ll quickly brief you through the recipe. Just start sautéing the onions and garlic, and add in some tomatoes, cilantro, and parsley with a touch of spice. Then the lentils and spinach go into your pot. Some more spice, water and a few minutes later it’s done. Sautee your onions and garlic on medium heat and don’t be tempted to rush through this step by turning up the heat. The garlic should not brown as it will make your lentil stew bitter. You can use a cup of canned diced tomatoes instead of fresh tomatoes. Fresh spinach can be substituted with frozen, thawed spinach. In a medium-sized pot, sautee the onion and garlic with the olive oil until soft and nearly golden. Then add the tomatoes and paste and keep sautéing until the tomatoes release all the water, and keep cooking until most of the tomatoes water is evaporated. Add the herbs and spices and sauté for another couple of minutes until the mixture looks like a thick paste. Add the stock and bring it to a boil, then add int he lentils and cover the pot. Cook the lentils for 15 minutes until they start to soften up and then add the spinach. Sautee your onions and garlic on medium heat and don't be tempted to rush through this step by turning up the heat. The garlic should not brown as it will make your lentil stew bitter. Delicious! My husband and I both thought it was great and neither of us eat lentils normally and are not vegetarians. Very pleasantly surprised. Made this to try to eat healthier. Thanks Monica!! You really made my day!! I know the feeling with recipes that don’t look super appealing like this one! So happy you enjoyed it and didn’t judge it hhahahahah 🙂 Hope you try more recipes! I tried to cook this and my lentil all burnt to the bottom of my pot. I even switched to a different pot after and the same thing happened. I followed the instructions exaclty. Do you know why? Hi Stacy, did you try lowering the heat a bit, or adding a bit extra liquid to the lentils? I think it’s either of these reasons. Sometimes you stove could run high and evaporate the liquids before the lentils are cooked enough so they end up sticking to the pan. Or, the lentils were stored at your grocery store for a while and need a bit extra liquid than usual to cook all the way through. Please try it one more time, keeping an eye on the amount of liquid to cook the lentils all the way through. Just keep adding liquid as needed.